I meant to do another one of these before now, but I guess there’s no real rush. 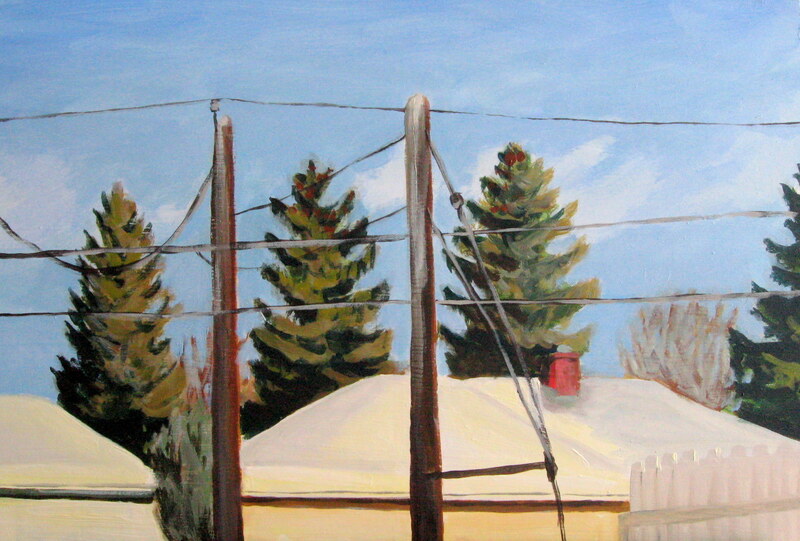 This is a partial view of the alley behind our house so it’s mostly rooftops and power lines. I did this same view at sunrise back in October with the intention of painting it at different times of day and in different seasons (as Monet did with his Haystack paintings). This one was done between 2:30 and 3:30 pm over three afternoons. 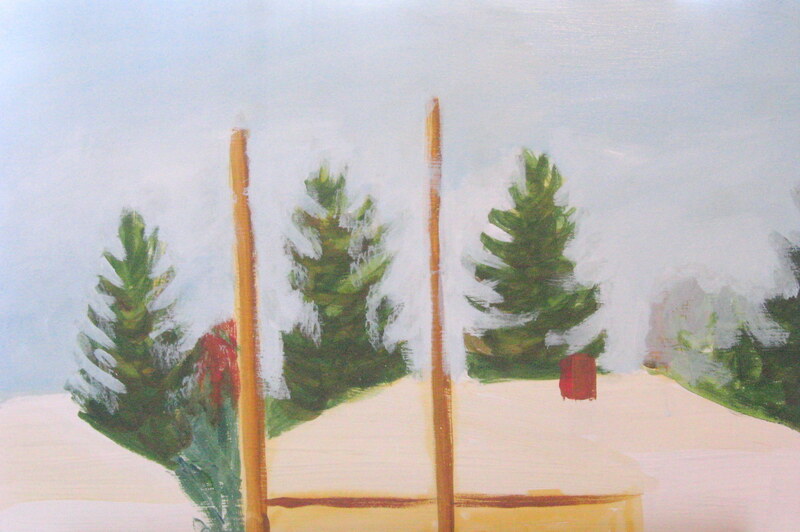 I am also trying something that a friend did on her blog, which is to show the in-progress stages of a painting. I found it fascinating to see how another artist works in stages so maybe other people would find this interesting. It would be more advantageous to do this on a prolonged painting (in that I could get a few weeks of posts out of one painting), but I tried it out on this quick study anyway. Whether I’m doing a more prolonged work or a quick study, my method tends to stay the same—I work on everything at once, moving from the general to the specific. The in-progress photos turned out well and I like how it makes it look like the painting is coming into focus. Neato. It’s interesting to see the progression from the different times of the day on these three paintings. 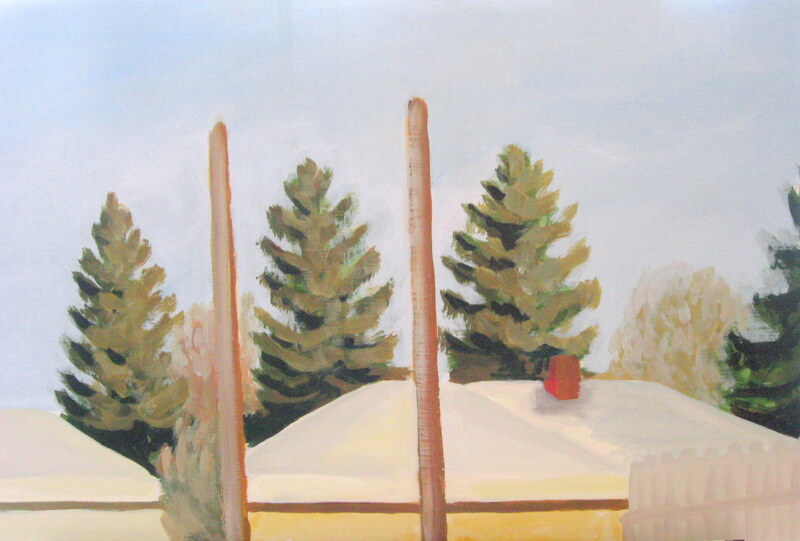 You have your own brand of quiet realism here, that resembles artists such as Edward Hopper, a favorite of mine. Double Neato! Painting with Acrylics in my Living Room.